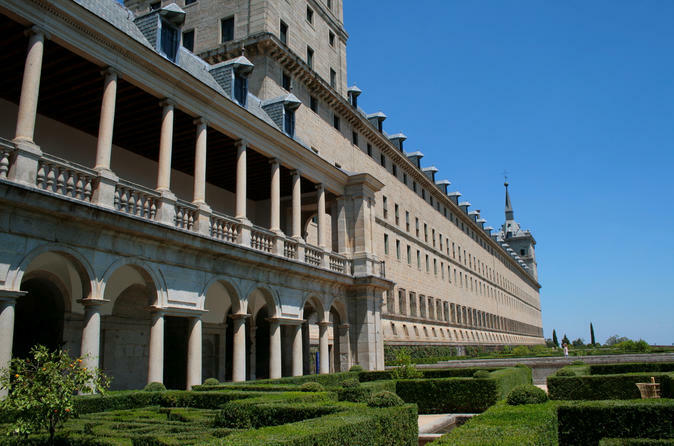 Visit two of the most impressive monuments in Madrid, the Escorial Monastery and the huge cross and site of The Valley of the Fallen, on this exciting 5-hour tour. You will have the option to upgrade this experience by enjoying a tour to see the World Heritage Site of Toledo. Start your day by greeting your guide at the meeting point near the city center, or a pick up from your hotel previous to departure time. Hop on a coach and start your journey to San Lorenzo del Escorial municipality, in the province of Madrid. Your first stop will be the Monastery, a symbol of greatness and declared a Historical Heritage Monument. You will be visiting the following areas: the monastery, the Royal Palace, the Royal Pantheon, the Basilica, the Cloister of the Four Evangelists and the Chapter Houses. From there, you will get back on the coach again and head towards The Valley of the Fallen erected in the beautiful Cuelgamuros Valley in the Guadarrama Sierra. Toledo Tour option: Upgrade your experience after the morning tour in San Lorenzo del Escorial, make your way to the city of Toledo. Stroll through its streets with your guide and discover the rich history and culture behind its walls.